Alexie's first book for children is a picture book to cherish, starring a strong-willed little boy who just wants to make his mark on the world with a name all his own. 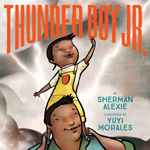 The fun-to-read story is slyly irreverent yet full of love, and the bright, meaningful illustrations by Yuyi Morales tell a delightful story of their own while bringing out all the meaning in Alexie's words. Returning to the same lush Alaskan landscape as The Snow Child, Ivey's second novel is as stunning and enchanting as her first. Telling the story of newly married Colonel Allen Forrester and his wife Sophie, as they endure a long separation when he is charged with leading an expedition into the Alaskan wilderness, Ivey constructs an absorbing and beautiful epistolary novel of adventure, danger and discovery and a love story fraught with an equal fear of the unknown. Moor's excellent debut is a bookseller’s dream, the kind of book we know is just the fit for that perfect customer—any reader who values superb writing, probing curiosity and the exploration. Moor guides the reader with evolution, anthropology, adventure and reflection through the literal and metaphorical trails that lead our lives. A sweeping saga spanning more than 700 pages and nearly 300 years, Proulx's magnum opus follows two families for generations as they attempt to tame their world and conquer the physical and metaphorical forests that surround them. A lush and ambitious piece of literature that may be her best work yet. This brilliant book will make your sides hurt with laughter while inspiring empathy to the difficulties of living as a large, feminist woman in today's world. An important book for fostering perspective on the overweight population (over half of all Americans) and women's rights. West uses humor as a gateway to grab the attention of those who may not normally want to read a "feminist book." A conversation starting read.